Reduce chips, abrasions and unsightly dirt build up on body panels and fender wells while maintaining optimal shock resistance and lasting material resiliency with Rally Armor UR (urethane) mud flaps for 2010-13 Mazda3 and Speed3 hatch and sedan. Rally Armor UR mud flaps are dependably flexible despite extreme environmental shifts of which include high hot to sub-zero low temperatures. Crafted from premium polyurethane, a highly desirable material utilized in the construction of stable and enduring parts industry-wide, the mud flaps are fabricated to steadfastly repel high impact forces, resist material deformation and memory as well as countering color-corrosive UV rays. Rally Armor UR flaps are recommended for 2010-13 Mazda3/Speed3 owners not only interested in 4 corner protection against road debris but also seek inherent flexibility and long wearing durability in their mud flaps. 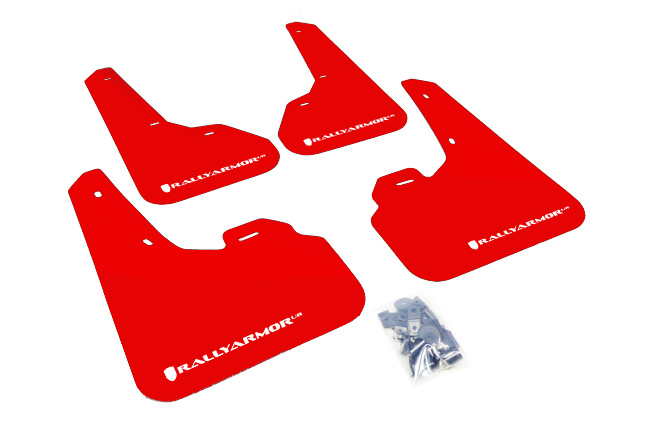 From conventional paint damaging sources ranging from salt, mud, gravel, tar to glass shards and plastics shreds, Rally Armor urethane mud flaps are designed to preserve a vehicle's finish from preventable premature deterioration while maintaining their natural form. Proactively protect and defend with Rally Armor UR mud flaps.